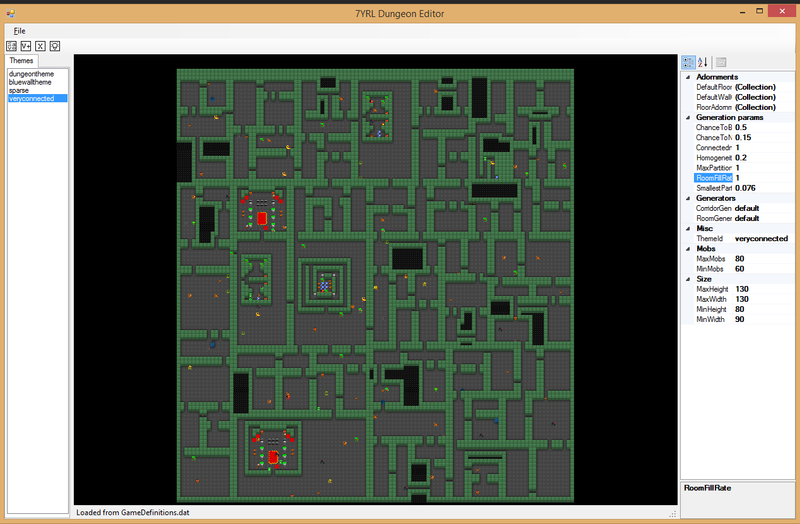 7YRL (the 7 Year Roguelike) | From Ignorance to Roguelike bliss in just 7 years! Proficiencies – the more you use a weapon/armor/item, the better you get at using them. Higher bonuses, improved effects, maybe even unlocking new powers. 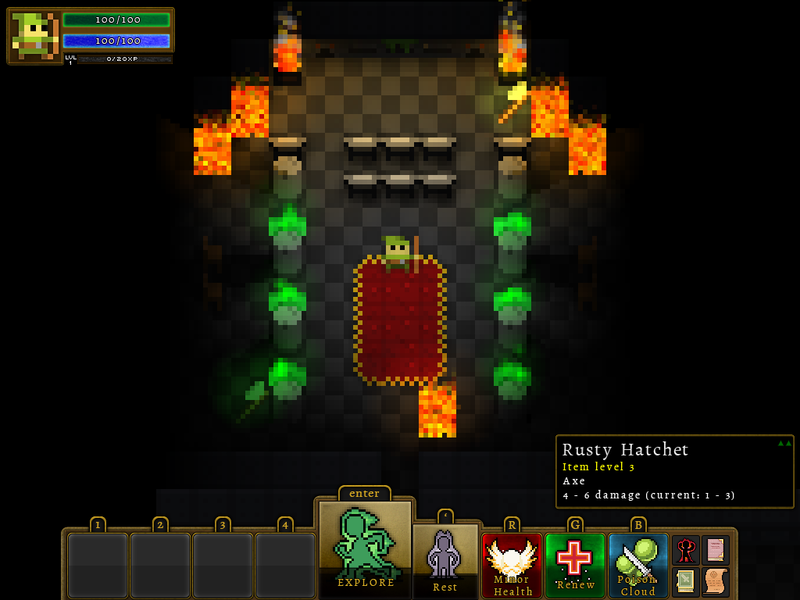 Crafting items – When a player starts a new gameslot (e..g from nothing), the Dungeon is populated with only a bare minimum of weapon, armor, and item types. 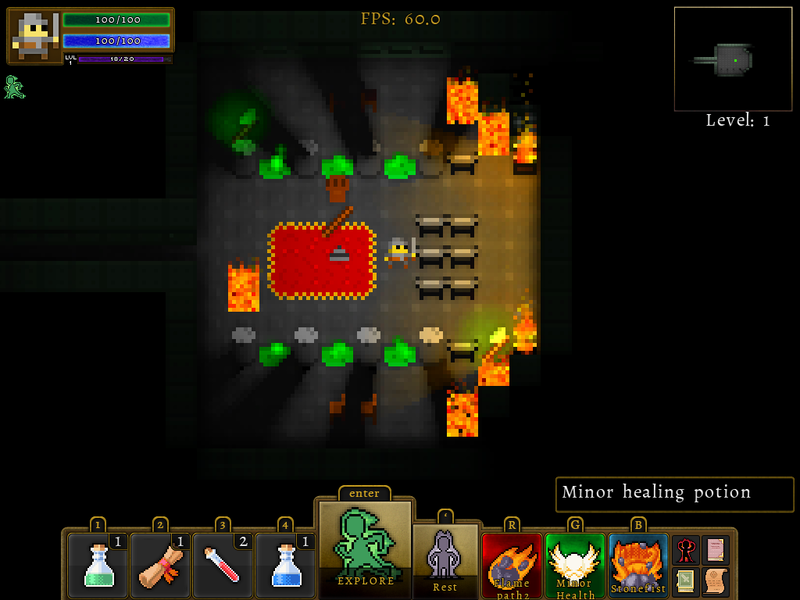 The player can increase the variety of objects by crafting them using Plans and Ingredients that they find and decipher. 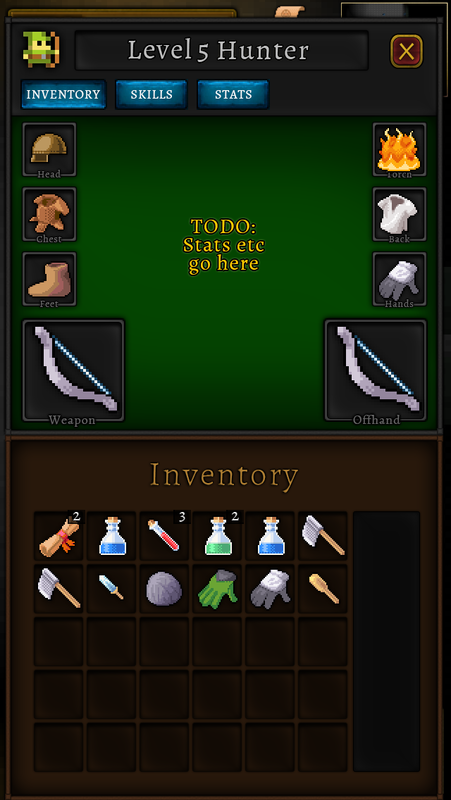 Once deciphered, the item can now appear in all subsequent games as drops. Professions – there will be 7 professions in the game which each have 10 levels that you can gain. Each level within each profession will provide a substantial, game-changing benefit (e.g. +100% gold drop; ability to add powers to items; double bag space in inventory; unlock alchemy & ability to craft potions; etc). 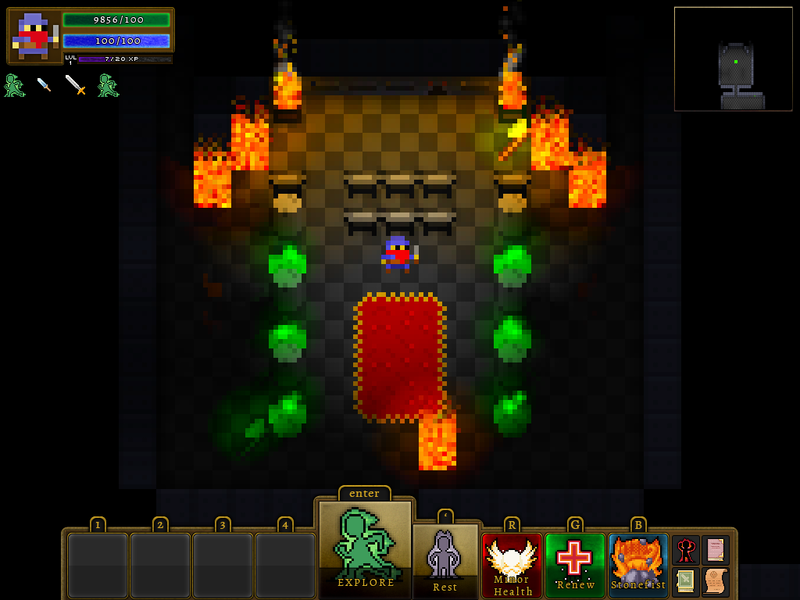 Players will gain profession levels by crafting items; deciphering a plan will gain a profession point; gain enough profession points and you’ll gain a level and the corresponding benefit. 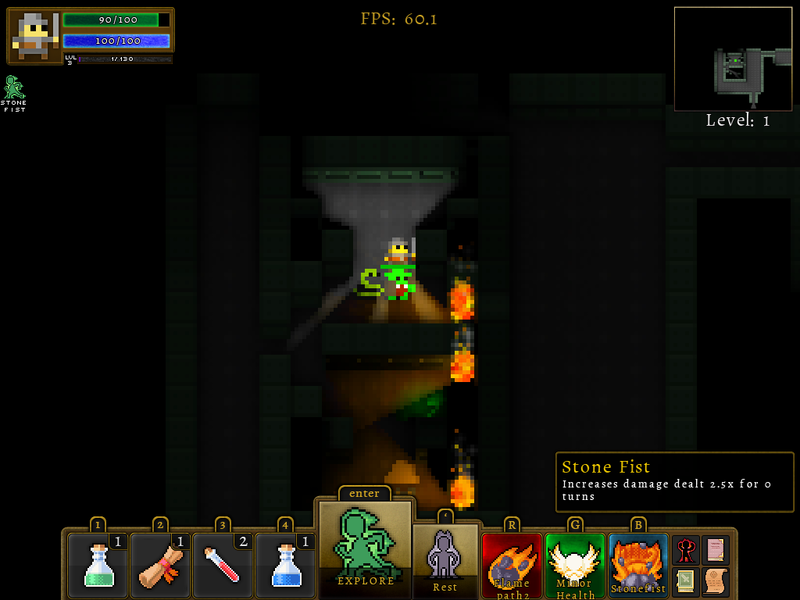 Augmenting items – Players can also use Runes to augment items. I haven’t fully decided how best to do this yet, but the gist is that you can turn a common item (e.g. dagger) into a magic item (e.g. holy dagger) and these augmented items can then appear as random drops in subsequent games. This provides another min/max opportunity for the player; given a handful of Runes, you can learn a Skill that helps just that character, or augment a weapon that helps that character and all subsequent characters. Items can be augmented up to four times, from common to uncommon, to rare, to epic, and finally to legendary. 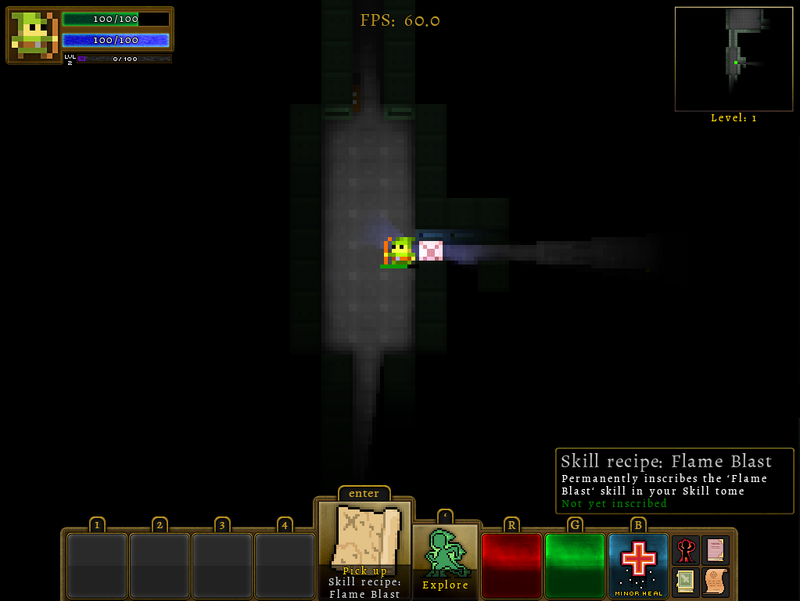 Mob mastery – Killing a monster of specific type gives you an awareness of its weaknesses – e.g. 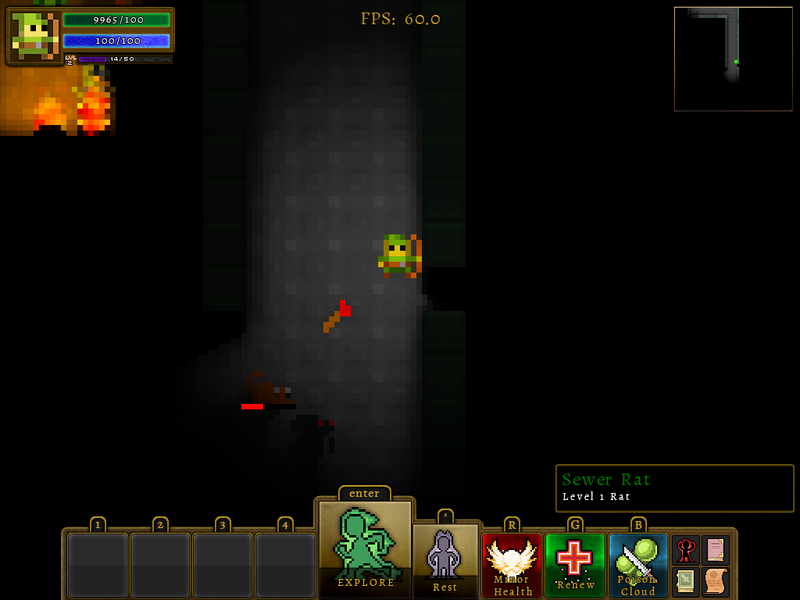 a rat is susceptible to blunt damage (hammer = +25% damage) but is agile so takes less damage from large, sharp damage (sword = -25%). This knowledge is written in your Mob Tome so later characters gain it. The current character also get flat % bonuses the more you kill a specific type of mob (e.g. kill 10 rats, get +10% damage against them) – that flat bonus probably won’t carry across characters. 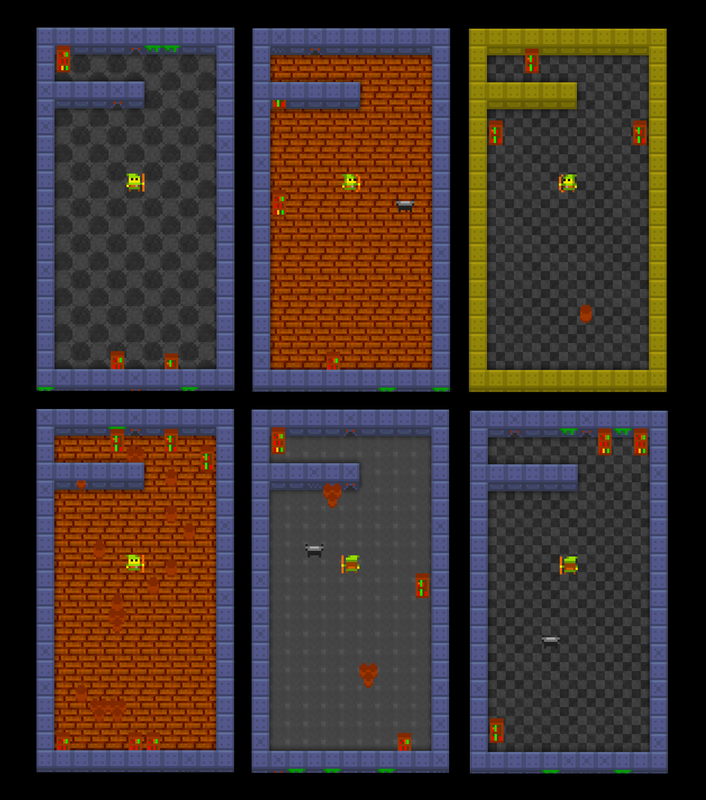 Ultimately, the persistence of the above will make the earlier levels easier and get the player into later (less experienced) levels quicker, reducing the redundancy of those earlier levels. As I started implemented more complex Skills, I realized that the existing event/action infrastructure didn’t provide enough granularity for targets, especially when I started getting into chaining events; e.g. … or cast it when a friend of the player enters the cell? 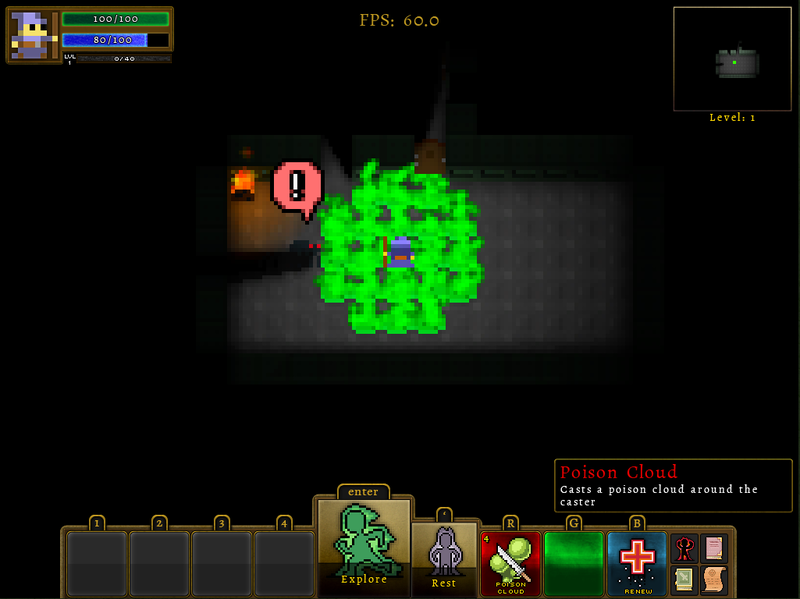 Put in English: this is the “healTrap” skill; it places a trap that when a mob steps on it, sprays healing globes all around which the player can pick up. Almost any part of that can be changed, allowing me to quickly and easily create new skills. Item powers (e.g. healing potion, renew potion, magic weapon) work exactly the same way. This required a complete rewrite of the Event/Action system; it’s much better now, but was a ton of effort to do. Glad it’s done! Once the Event/Action code was rewritten, I implemented the infrastructure that allows for skills to be inscribed (persisting between characters), learned (enabling it for the current character) and activated (allowing the player to chose between learned skills). Skills are categorized as Offensive, Defensive, Utility, and Passive – a character can have only one of each type active at a time. 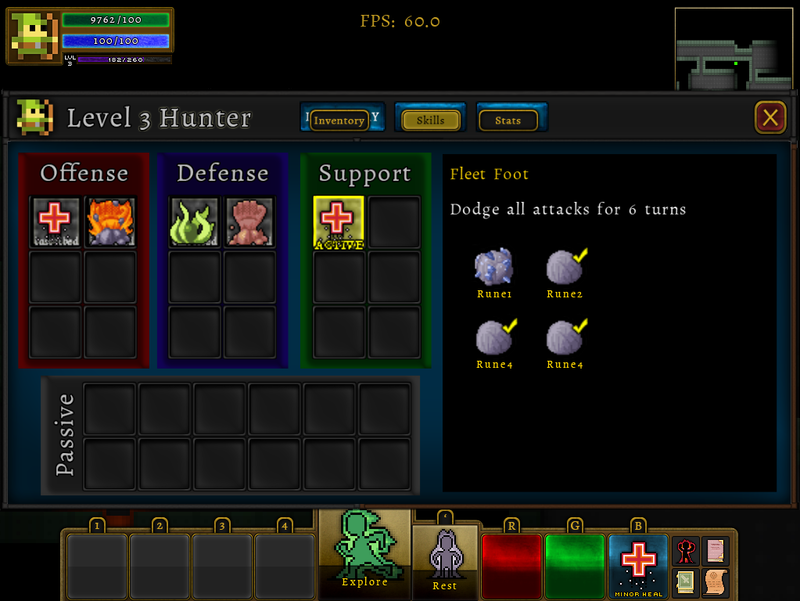 Here, the player has inscribed 5 skills (these skills remain inscribed for all subsequent players), has one active skill, and has 3 of the 4 runes necessary to Learn the inscribed ‘Fleet Foot’ skill. Once the player finds that last rune, they can Learn and Activate the skill, and it can appear in the R/G/B slots at the bottom of the screen. All in all, I’m quite happy with how flexible the skill infrastructure worked out to be, and am looking forward to using it to create a wide variety of different skill types once the infrastructure work is all complete. I’m still playing around with what the final look and feel will be for the game. I’m playing a bit with a richer/deeper color style to see how it feels. 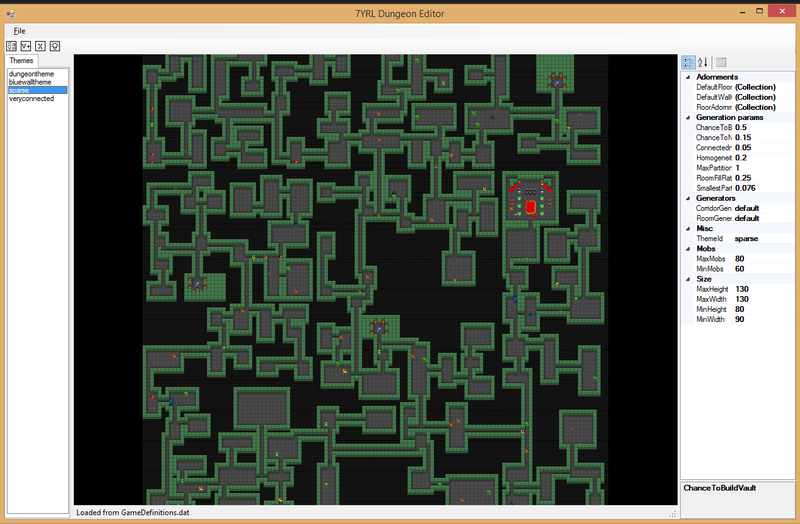 I like it, but have yet to convince myself that mixing non-8bit interfaces in a predominantly 8bit game is a good idea. Still, I think it looks good as a placeholder. 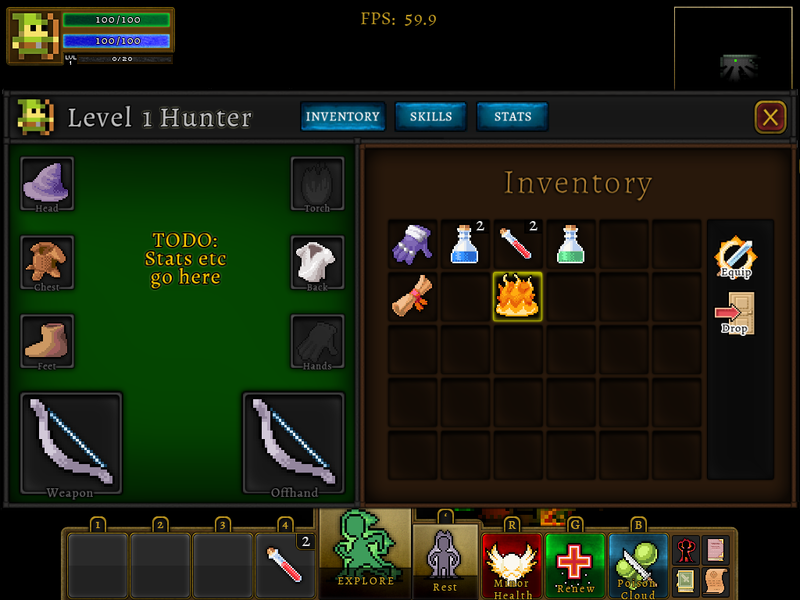 Items can now be dragged to/from the inventory slots and the equipped item slots. The dragged tile also appears as a “ghost” image in the target locations. This was a unexpectedly large amount of work, mostly in the equip/unequip flows and the sheer number of edge cases; e.g. 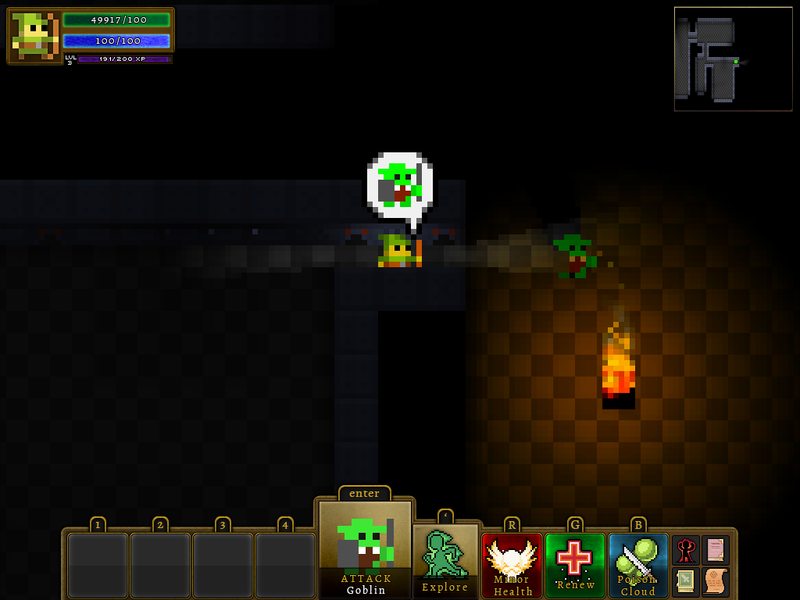 user has a one-handed dagger and a shield equipped – when they drag a bow over to one of the weapon slots, both the dagger and shield should automatically be unequipped and moved into the player’s inventory when they equip the bow. But what if they have a full inventory? Or, what if the dagger is unequipped but then the shield fails to unequip because it has a curse on it? All of those sorts of cases are handled. This is probably 2.5 of the last 3 weeks. The UI engine is written to be resolution-agnostic, allowed me to quickly get it up and running on any monitor or device. While it works, the unfortunate reality is that it ends up creating UI that is way too small on a 4″ screen, and also not optimized for how you hold it. 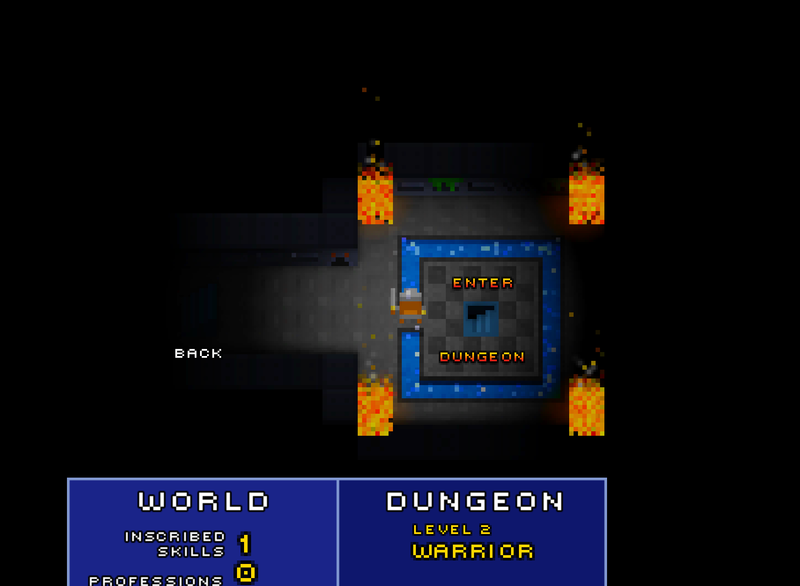 So I’ve completely refactored the UI for mobile. 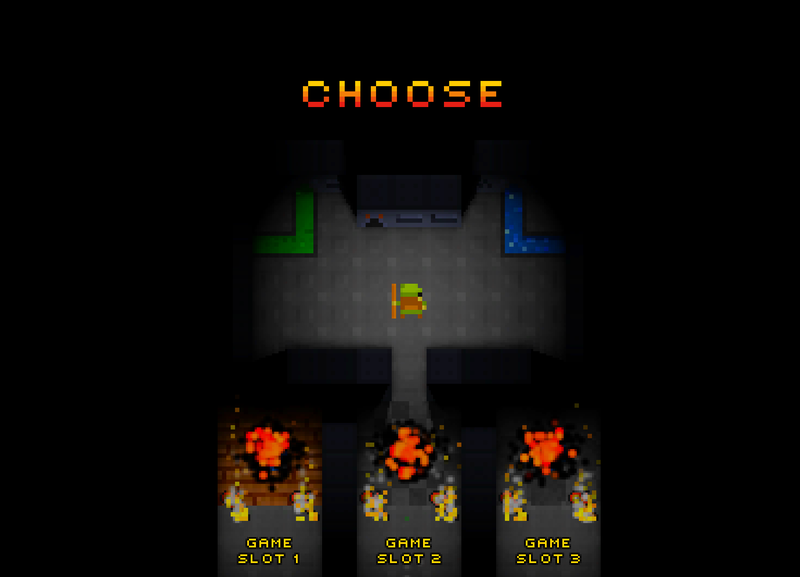 Here’s the updated main menu screen. The design (etc) is obviously placeholder, but it gives a sense of how I’m trying to emphasize large clickable items in menus. I spent a bunch of time creating different prototype of where the buttons would go, trying to find the combination that felt best when holding the phone vertically. I really like where it ended up – I’ve removed the action slots, but the result is buttons that are very clickable and are in a very natural place for where your thumb happens to land. Well, if you’re right-handed, that is; but don’t worry south paws, I’ll have a mirrored version of the controls for you as well. Again, the controls are very intentionally laid out so that the primary CAB button is right where your thumb happens to naturally fall. I can play a surprising amount of the game without moving my hands. And finally, the iPad currently uses the existing pc/mac layout – the buttons are the right size for it, but they aren’t in the optimal position for someone holding the device; I’ll tweak that in time. 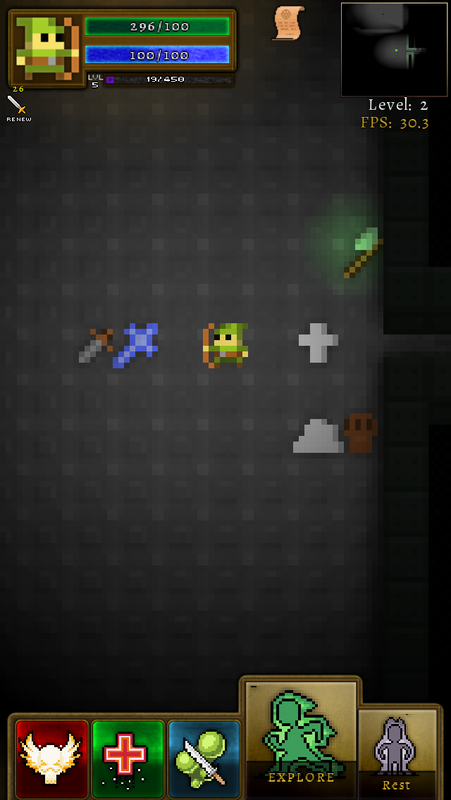 Items can now stack in the player’s inventory. ’nuff said. Man was this a pain. So many edge cases! Perf on the iPhone had dropped below acceptable levels (e.g. 20fps with ~20 lights on screen). I made a few changes so that it rarely drops below 30, but there’s definitely still work to be done here. Here’s a shot shortly after firing a bolt. You can’t tell from the picture, but the arrow rotates to face the right direction when fired. All in all it feels pretty good. Not much to look at, but very useful in testing and tweaking. You can also see the various themes in the list on the left. 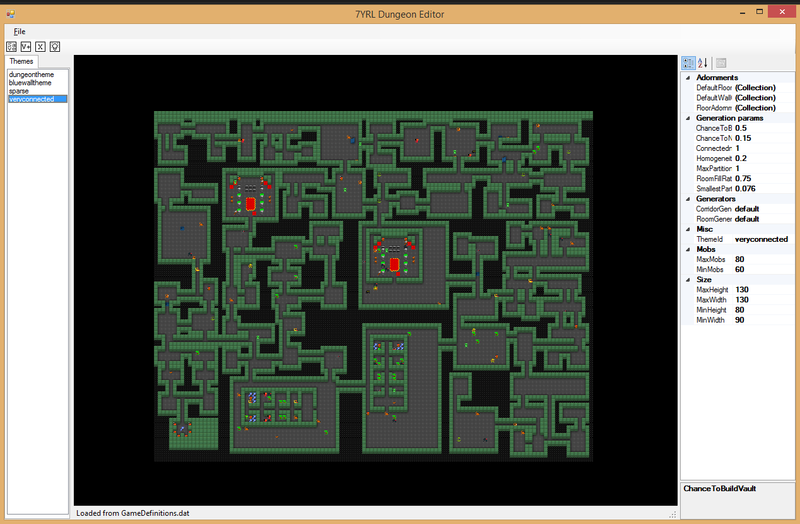 I’m not leveraging this fully yet, but once I get the rest of the game up and running and am coming back to tweak things, this’ll help a ton in ensuring dungeons feel less repetitive. I also created a few more test vaults; you can see them in the pictures above. 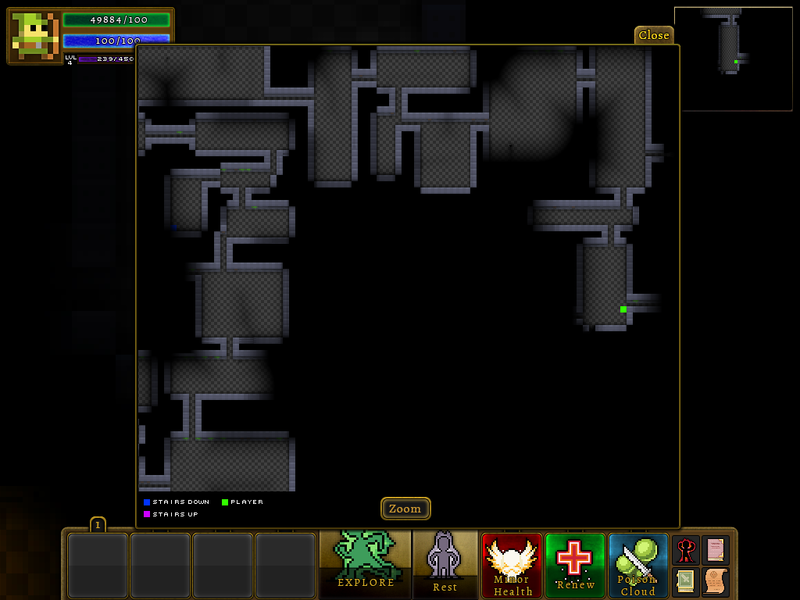 Also, very large rooms will sometimes have a vault dropped into them to break up the large empty space. I’ll have to see if this feels too artificial or not. I’ve created a tracking site up on Trello here: https://trello.com/b/T9aMWWsv. If you want to see what I’m working on or what’s next for 7YRL, check it out! These took a good bit longer than expected, but the joy of a seven year dev cycle is that that’s okay :). And here’s zoomed in. 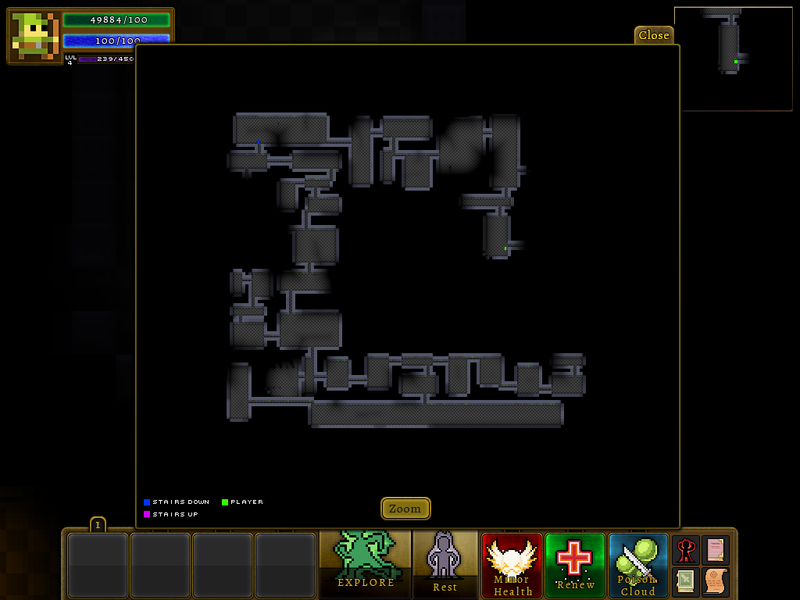 The map window also increases in size if the user resizes/fullscreens the game. When I first started working on 7YRL, I was primarily targeting mobile devices. 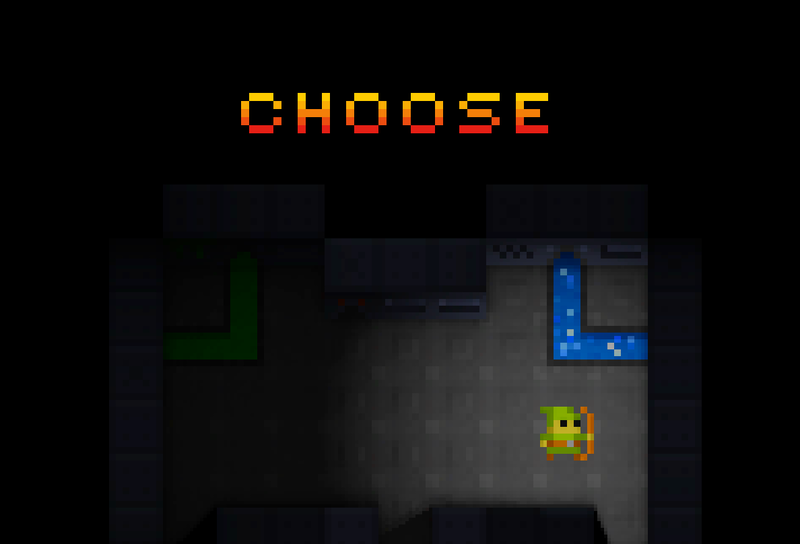 On those devices, roguelikes tend to suffer when it comes to moving the character around; tapping on small tiles on a small phone can be hit-and-miss. My solution is the ‘Contextual Action Bar’, or CAB – the intent of these is that they display the most common two actions that the user might want to perform. When a mob appears, attacking that mob is the primary action; when an item drops, picking it up is the primary (upon picking it up, equipping it becomes the secondary action). The most common action is sen in the picture above – Explore. This is the command I use most often in DC:SS and I think it works wonderfully – it just does the exploring for you. And that’s not a “Progress Quest“-esque experience; it just removes the extensive UDLR needs of a roguelike and gets you to the interesting content and interesting decisions without a bunch of walking from Point A to Point B. The biggest challenge to getting the CAB right will be ensuring it’s consistent enough that players can build muscle memory to the point of knowing what will happen when they select primary or secondary even without looking at the CAB. That said, I ultimately like the Primary/Secondary CAB slots so much that I’m bringing them into the PC/Mac experience as well. Here’s the CAB right after you encounter a new mob. The player’s “normal” action is to attack a mob so that’s primary; they may not care about it though so explore is the second action. The game keeps a queue of objects-of-interest (eg in case 4 monsters appear at once) and does a good bit of work in the background to pick the one the player most likely wants. Lots of bug fixes this time around as well. In particular, a bug slipped in last time that caused an intermittent crash when ascending/descending between levels. That’s been squashed. Ranged attacking, including ranged AoE attacks. 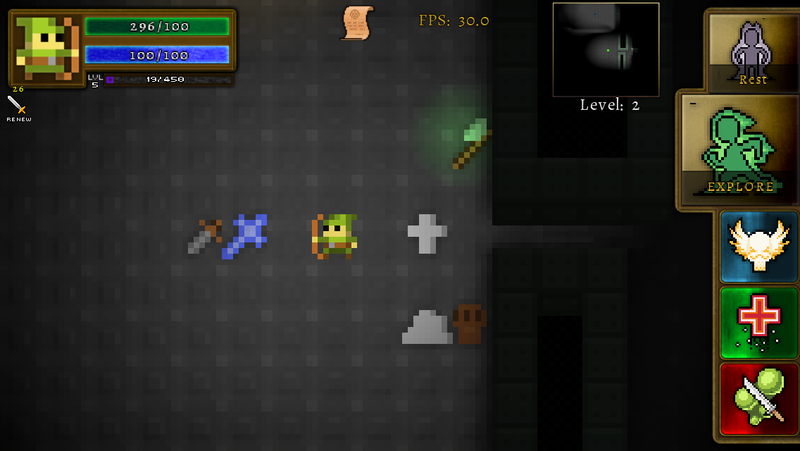 This will work for both weapons (bows, wands, etc) and skills (e.g. a targeted AoE poison cloud skill). The latter will require a chunk of infrastructure work to the event/action system – e.g. 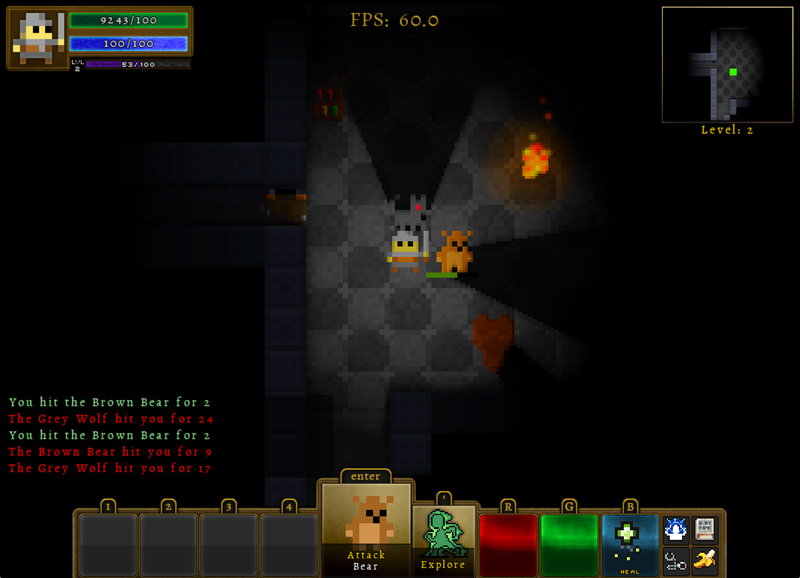 ability to target a particular mob or a particular cell, max distance on AoE attacks, etc. Stackable items in inventory. 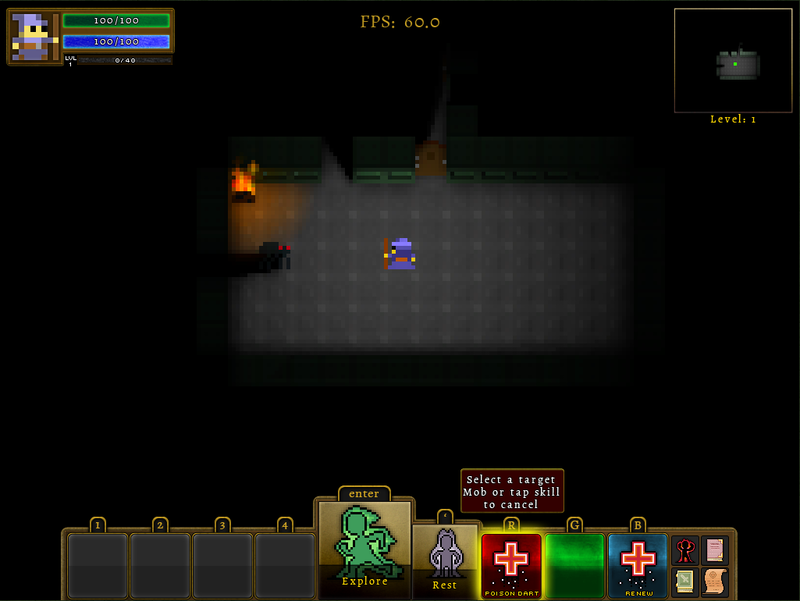 Making items stackable is straightforward, but it requires some grunt-work UI to make it usable. Keyboard in itemgrids. 7YRL already supports keyboard in most of the UI, but not in itemgrids (eg when picking up multiple items or when looking at inventory). I’d ship v1 without it, but I’d like to go ahead and get that done now if possible just to get it off the list. Figure out mouse-over equivalent for tablets and phones. 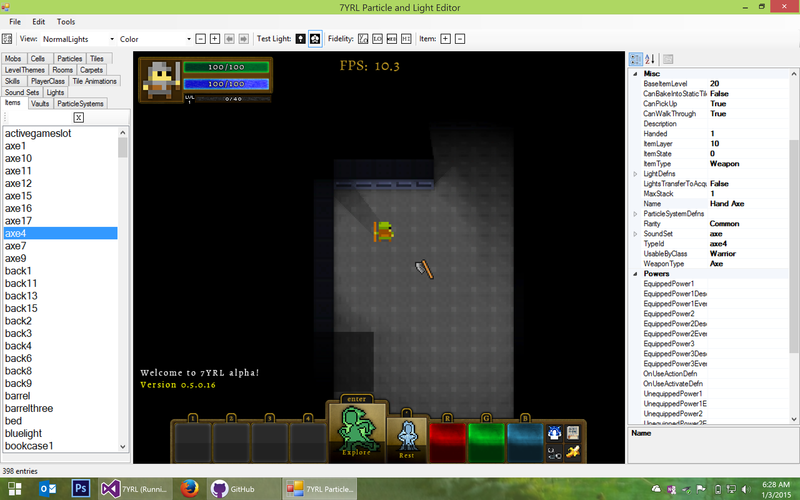 On the PC or Mac you can mouse over items, mobs, or skills and see a tooltip with information about it. I need to figure out the best approach to that for devices without mice. Press-and-hold is the default answer which I’ll probably go with, but I’d like to find something more discoverable if possible. Failing that, I’ll move forward with press-and-hold and have to figure out how that impacts the input systems. XP and leveling infrastrucutre in place (but no rewards for levels). 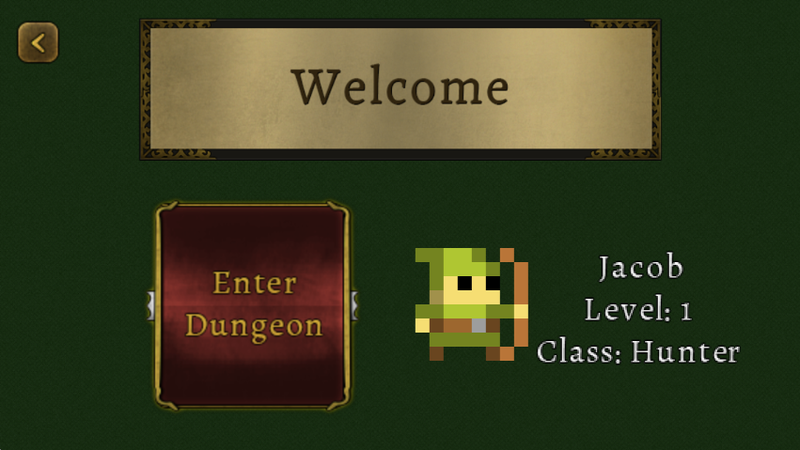 3 initial skills for one player class added to support UI. Mobs obey partitioning (drop from active list if path to player is > their max ‘follow’ path length. I’ve uploaded new demos for both PC and Mac and will update the links over there –> once they’re accepted. Check back soon! I do love starting a new phase as it lets me do a bunch of fun stuff up front. 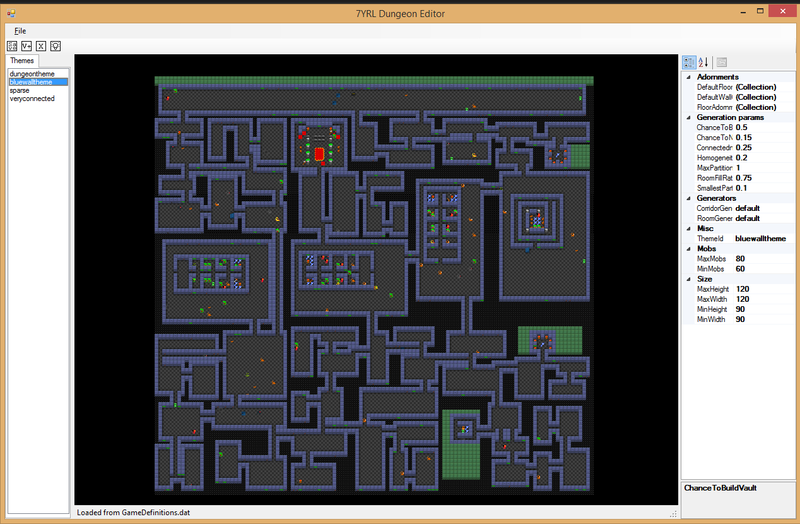 That said, this particular phase will be the most grudging as it consists of me paying down tech debt I’ve been building up, and turning 7yrl into a real (albeit unbalanced) roguelike. There are a bunch of things to do, but I’ll be glad once they’re done and behind me so that I can start focusing on Phase 5 where I get to extend beyond ‘vanilla’ roguelikes and bring in less common features; Crafting, Professions, and Skills.